In 2012 close to 12,000 runners participating in the high altitude Scotiabank Calgary marathon. The Zyris team together with Calgary’s East Village marketing team developed an app and tracking system, called the Marathon Tracker, that allowed spectators the ability to track the progress of the marathon without being on the front lines, or running alongside the athletes. Local marathon spectators did not have a cost effective or accessible way to track runner and marathon progress. At the time of development, typical solutions provided spectators with runner times and not exact locations on the course. 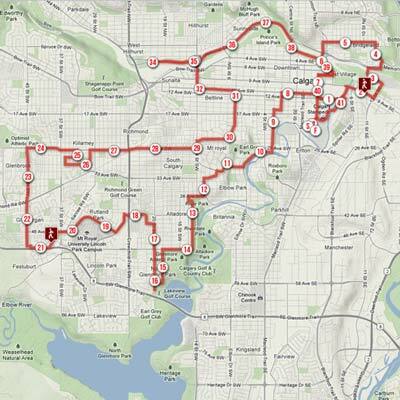 Zyris developed a suite of applications including an android based mobile application, and HTML 5 enabled website that utilized GPS location technology to track and display runner athlete progress throughout the 2012 Scotiabank Calgary Marathon course. The application allowed spectators to select their favorite athletes that were using the tracking system and watch their progress from any HTML5 enabled web browser on desktop, iPhone, iPad, or android mobile device as well as through a native Android mobile phone app in real-time. The project was such a success that Zyris was featured on both the CBC Calgary and 660 news websites. Comtv.ca also broadcasted the app and runner success throughout the marathon event. Though only some of the runners used the Zyris Marathon Tracker for the main event, many other athletes used the system for the smaller Marathon events. Overall the Zyris marathon tracker was broadcast to 250 of spectators watching the progress of select 10 athletes through the Zyris Marathon Tracker.